Artist Sally Weber designed Celestial Chance to explore traditional and contemporary visions of the sky. 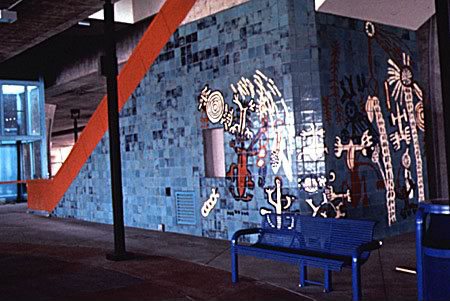 Noting that Long Beach Boulevard travels directly north under the station platform, Weber was inspired by a traditional Chumash legend about the North Star, and traditional Chumash and Gabrielino-Tongva pictograms. While cultures throughout history have seen the sky differently, they have always gazed at it in wonder. The Chumash legend is inscribed in tiles at both levels of the station. On the lower plaza level, tile murals around the staircases depict images inspired by traditional cave paintings from a local site. A red pointer, directed at the North Star, bisects both levels of the station. 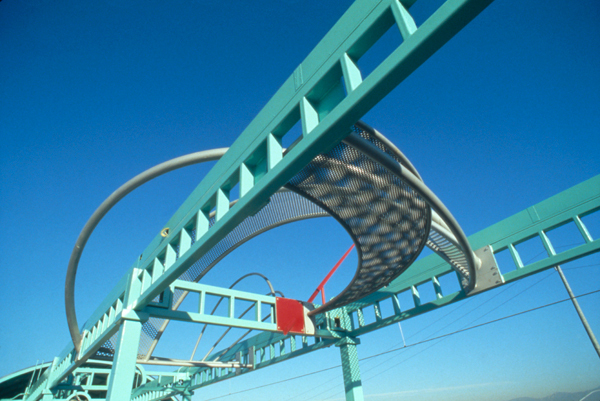 At the base of the stairs, passengers pass over the tile figure of the legend's "Sky Coyote" as they travel from the cooler, darker world below to the lighter, faster world above. On the platform level, sunlight splits into prismatic colors as it reflects off the holographic panels hung beneath the skylights. An overhead sculpture suggests early astronomical instruments and the circular movement of the sun and stars across the sky—or Sky Coyote's upturned basket of the Chumash legend. The Chumash saw that stars travel in circular paths across the sky, a fact that is often lost on today's city-dwellers. "The same sky is above us all, but we see it differently depending upon our traditions, beliefs, and the technology we have to explore it." SALLY WEBER was born and raised in the northeastern United States. She received her Master of Arts from M.I.T in Cambridge, Massachusetts and now lives and works in Ventura, CA. Weber works with light—its color and movement through time in a particular place—to establish a sense of uniqueness to a location and our experience of place. She began exploring the potential to integrate holographic materials into architectural environments in the early 1980s and has produced numerous public art installations and exhibited widely throughout the U.S. and abroad.